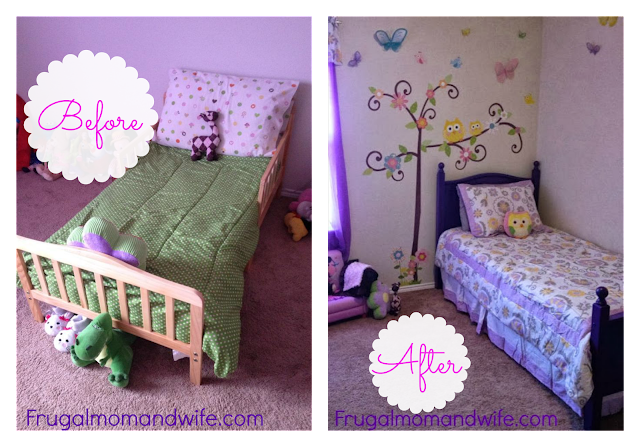 Frugal Mom and Wife: Girls Room Upgrade: Toddler to Big Kid! 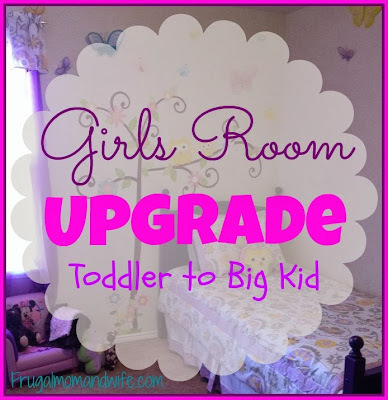 Girls Room Upgrade: Toddler to Big Kid! There is nothing we can do to stop our little ones from getting older and bigger. In turn they out grow furniture and accessories. For my little girl, I like to stick to a theme that can be elaborated with all sorts of adorable accessories. Color coordinating is key when making a variety of items fit together in a harmonious environment. I feel that a room should be a fun expression of yourself. After all, kids spend so much time in their room whether to sleep, play, or hangout. So I set out to upgrade my daughters room from toddler to big girl and I wanted to show you. As you can see in the left picture above, the room screams toddler especially the bed (Pottery Barn). All though so cute and tiny, it was time to say goodbye. We painted the originally white bed frame to purple to match the decor and so it didn't blend in with her walls. Her comfy mattresses (Signature Sleep) fit perfectly inside her twin bed frame without a gap which was wonderful. 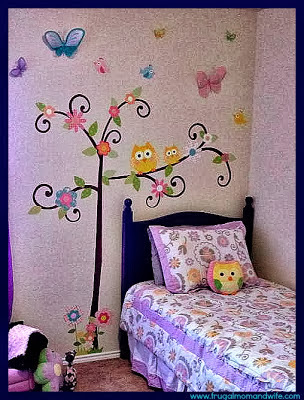 I simply love owls and so does my daughter so I embellished her room surrounding the cute creature. Pulling the colors all from that owl pillow (Circo) you see on her bed in the right picture. So it was only perfect to have the scroll tree mega pack (RoomMates Wall Decal) outlining her bed. I wanted something to go with her existing butterflies and tie everything all together. Her bedding set (JoJo Designs) coordinated perfectly with the whole decor. This design was all about color coordination with deep purples, lavenders, yellows, and pinks dominating the scene. I am pretty pleased in how it turned out and really enjoyed putting the whole room together. My daughter absolutely loved the upgrade. There was no sadness at all coming from that little girl, she was ready to have a big girl room. Keep in mind she's only four so that's why the above Minnie Mouse chair was very perfect not only for her size but her personality. What kid room would be complete without Dr. Seuss books.. that's just baffling. 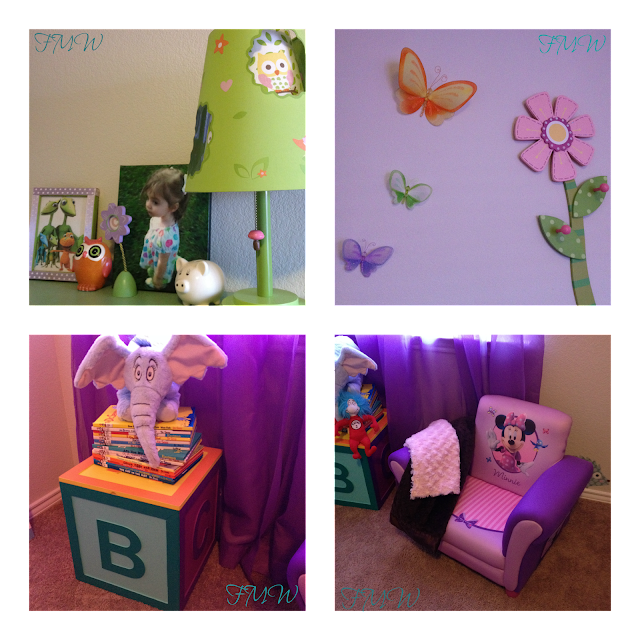 I stacked them in a fun way on top of her existing ABC block storage box that I made (here is a tutorial) for easy reading in her big girl chair. Hopefully it will be a long while until I do another upgrade on her room. Right now I am going to enjoy my little big girl as much as possible before she gets bigger. The decor may change through the years but making a fun environment is what it's all about. Thank goodness for little girls! 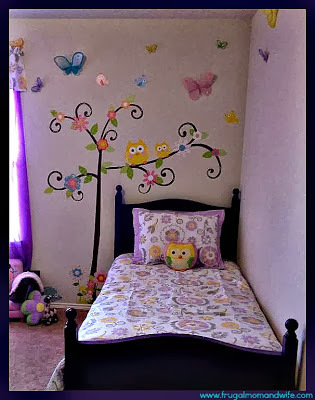 Very cute, we are looking for ideas for my granddaughter's big girl room. Thanks for the ideas. what a great upgrade--my daughter is 11 and loves owls so I'm sure you'll be good for a while. Awww.... this is really lovely. I love her wall designs. We just upgraded from baby to toddler bed, which is fun. I'm excited about the next step already!